An RV Vacation Paradise, So Many Great Things to Do! 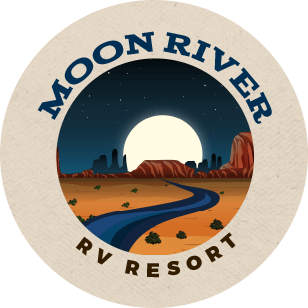 If you’re RVing to or from Las Vegas or Lake Havasu area, Moon River is the perfect place to spend an extra week during your trip. There’s so much to see and do that you’ll probably plan your entire RV vacation here next time! If you’re a quad/ATV/OHV enthusiast, it’s legal to drive directly out of the park. You’ll love the spectacular scenery, just waiting for you to explore. If water sports are your thing, we are only 1.5 miles from the beautiful Colorado River. In town you can rent kayaks, wave runners, and book guided fishing trips. Casinos, kayaking, fishing, golf & much more! Oatman, an authentic western ghost town and mining camp with wild burros only 13 miles away. Plan Your RV Trip to Mohave Valley Today!